"On the glorious day that Tulku Dragpa Gyaltsan is revealed, all of those who have been forced to "fly under the radar" of religious persecution will finally be able to emerge from the darkness of this purge." Western Shugdenites yearn for the reincarnated Shugden to go public, now decades after his rebirth. But, NKT, the foremost Shugden cult, has not been flying under the radar crushed by religious persecution, which according to NKT mythology would have begun more than a decade after Shugden reincarnated. NKTites believe that it is being persecuted by those who do not believe in the non-incarnate Shugden that NKTites devote their lives to. Perhaps NKT's persecution affinity is the reason why NKT has yet to make comment about - either to accept or deny - the announcement a few months ago about Shugden's "glorious" reincarnation. NKT has been one of the most prolific cults on the Internet, inventing a persecution that does not exist as it loudly and widely makes itself known. To do so, NKT insists that it is victimized by Tibetan affairs, aiming its psychobabble most notably against the Dalai Lama even though NKT claims that it is not involved with or subject to Tibetan culture, government or religion. While counter to beneficial spiritual development, NKT uses its falsified victimization ploy to grow its business. Remarkably successful NKT has been to amass substantial real estate, material and monetary wealth, relying in large part on government subsidies. Will the middle-aged Shugden ever emerge? When he does, will NKT finally be happy? Or, will a living Shugden that comes out of hiding be bad for NKT business, leading to another NKT-invented persecution against NKT? 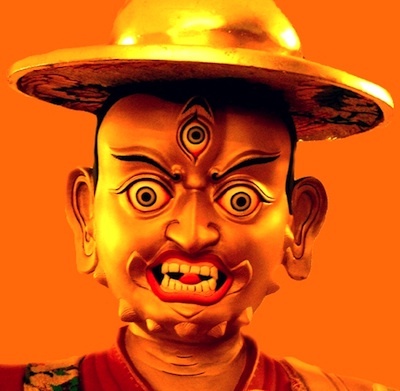 We wonder if the living Shugden looks like NKT's statues of him.